Lowdown: Thor and earthly love interest collaborate to save the multiverse from an ether wielding elf. Thor: The Dark World is one of those run of the mill Hollywood productions that shouldn’t be discussed too much. It is as hollow as, offering kindly to popcorn munchers (not that there’s anything wrong with that) but insulting anyone daring to try and analyse it. To make things worse, The Dark World is a sequel to the first Thor movie. I will therefore avoid adding insult to injury and remain brief. 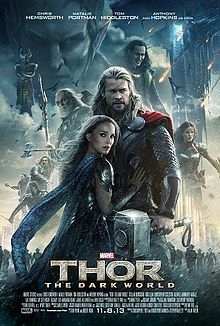 Thor (Chris Hemsworth) and his earthly love interest/scientist (Natalie Portman) return to regale us with the latest threat to the mythical Marvel multiverse, some CGI ether that destroys everything it engulfs and that a vengeful elf is all but happy to yield. If he could put his hands on it, that is, since it – for rather mysterious reasons – chooses to reside in Portman’s body. As a bonus, we get Thor in conflict with his king father (Anthony Hopkins) over inheritance of the crown, given Thor’s love interest in a short lived earthly woman. And, in the interest of creating sequel potential and connecting with the other movies in the ever thickening Marvel superhero universe, we also get a post first Avengers movie Loki (Tom Hiddleston). The result of this mishmash is a tale of two halves. The first half of The Dark World is rather pathetic in its attempts to lay down the shaky plot foundation it wets its hands with. It’s also pretty boring. The second half is when the popcorn machine gets into full throttle, the audience is no longer required to use their brains under false pretences, and the special effects and high budget of a Disney Marvel production shine. And that is pretty much all there is to say about this Thor sequel. Overall: Is a first half of suffering worth enduring for the second half of mindless entertainment? Maybe sometimes. Thor: The Dark World thus lurks in the nether [ether] regions between 2 and 2.5 crabs out of 5.